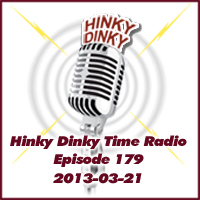 Hinky Dinky Time Radio, Episode 179 – Hinky Dinky Parlay Voo? Episode 179: Thursday, March 21, 2013 at 8:00 PM, Central Standard Time. By necessity, the shoutcast stream is in mono at slightly reduced quality. Tune in to http://hinkydinky.net/vaughntv for the best quality and live video from the studio! The archived shows are in glorious stereo and feature higher fidelity.